NL West? Check. NL Central? Also, check. After one final pit stop for gas and snacks, our road trip through the National League comes to an end with the NL East division. This division is home to three of my favorite systems in baseball, headlined by the incredibly deep Atlanta Braves system. Right behind them are the Mets and Phillies sneaky-good systems, both of which have a plethora of MLB prospects on the rise. In fact, five of the dozen prospects below hail from the Phillies system. If only I was eating a Philly Cheesesteak while writing this piece. Would seem oddly fitting. If you aren’t playing your dynasty leagues on Fantrax, you’re missing out on the deepest player pool and most customization around. Just starting out in a dynasty league? Then check out Eric Cross’ Top-250 prospects and Top-300 Dynasty League Rankings. Note – I did not include prospects that are already in my top-50 overall. With all the talent in this deep Atlanta Braves system, it can be easy to undervalue a guy like William Contreras. The 21-year-old Venezuelan backstop has yet to appear high on any industry list or dominate at any level so far. That’s likely about to change as Contreras advances to the upper minors in 2019. Throughout his minor league career, Contreras has displayed a good feel for hitting, routinely finishing with high batting averages. Up until 2018, the power had been more of the gap variety, but Contreras added a little loft to his swing and began pulling the ball more to his pull side, leading to a career-high 11 homers in 390 at-bats. There’s more where that came from too. Long-term, Contreras projects to me as a .275/20 type that can hit 5th or so in the batting order and rack up the RBIs. It wouldn’t shock me if he turns out just as good as his older bro, Willson. By this time next year, you’re likely paying the price for a top-5 dynasty catcher if you’re trying to trade for him. You won’t find Andrew Moritz on either the MLB.com or Baseball America top-30 Atlanta lists. Me? I ranked him 20th in Atlanta’s deep and talented system. Yeah, I’m quite high on the 6th round pick out of UNC Greensboro. If you don’t anticipate much power, I believe you’ll be impressed with Moritz’s overall offensive skill set. During his three seasons at UNCG, Moritz hit a robust .406 with 59 extra-base hits (10 homers), 36 steals (in 46 attempts), and had as many walks as strikeouts (70). With above-average contact skills, plus speed, and a solid plate approach, Moritz is a prospect that could sneak into my top-250 next year if he continues to display these tools in Single-A this season. Right behind Moritz in my Braves top-25 is another 2018 draftee in 20th rounder, CJ Alexander. Forget the fact that he was a 20th round pick, Alexander has the makings of an above-average offensive third baseman that can hit for both power and average. Alexander uses a compact swing and generates plenty of natural loft with a slight uppercut swing path. While he’s been more of a hit first, power second hitter this far, there’s above-average raw power here that should begin to peak out more frequently during Alexander’s first full minor league campaign in 2019. Those in deeper dynasty leagues would be wise to take a flier on him now. The Marlins have a bunch of arms near the top of their top-25 prospect rankings that are intriguing, but for me, the one I’m the most excited about is Braxton Garrett. Since being drafted 7th overall in the 2016 draft, Garrett has made just four starts, all coming in 2017. Now hopefully with all the injuries in his rearview, Garrett can finally get back on the mound and showcase his exciting three-pitch arsenal of above-average or better offerings. At least they were before undergoing Tommy John surgery. It’s always hard to predict how a pitcher will return from this type of surgery/layoff, but Garrett is one to bank on and invest in now while his price will likely never be lower. This Mets organization has done a phenomenal job on the international market over the last two years, especially when they nabbed Ronny Mauricio for $2.1 million in the 2017 J2 period. Mauricio has tools to dream on. Good dreams if you own him in dynasty, and full-on nightmares for opposing pitchers. I’ll admit, when prospects have the tools to hit for both power and a high batting average, I get a tad giddy. And as you could probably guess from Mauricio’s inclusion here and projected 2020 rank range below, he’s a prospect I’m investing heavily in for dynasty formats. Even though he didn’t hit many homers in his pro debut last season, Mauricio did rack up 12 doubles and projects for plenty of additional power down the road. As a switch hitter, Mauricio has clean mechanics and makes consistent loud contact for both sides with natural raw power. Once he fills out his 6’4 frame some more, that plus raw power should become more and more apparent. It’s not out of the question to predict a .300/30 hitter when it’s all said and done. With the hype surrounding Mauricio beginning to grow, good luck getting him at anything outside of top-100 prospect value come this time next season. As I said in my Mets top-25, Simeon Woods-Richardson is one of my favorite non-first round arms in the 2018 draft class. Armed with two plus pitches (Fastball and curve) and a changeup that has flashed above-average, Woods-Richardson has #2 starter upside, especially if that changeup develops into a third weapon for him. He gave us a small glimpse of his potential in the Appalachian and Gulf Coast Leagues after being drafted and should advance to Single-A this season. With his dynamic three-pitch mix, solid command, and high strikeout potential, SWR should be a quick mover up my rankings. Apparently, all people named Luis Garcia are good at baseball. Well, at least two of them. The Nationals Garcia is already in my top-50 overall and by this time next season, this Philadelphia one will likely join him. Offensively, Garcia is a contact-oriented hitter with clean mechanics and plenty of bat speed. He’s not much of an over the fence threat, but power isn’t the reason why he’s already in the back-end of my top-100 and poised to rise higher than that. No, Garcia is included here due to his batting average and speed upside. I would grade both of those tools as plus with the potential to hit close to or above .300 with 25-30+ steals annually. Even if the power never grows to more than 5-10 per season, the AVG/Speed upside is tantalizing. Pair those with an advanced plate approach and you have a high upside/high floor shortstop prospect. Don’t you just love those? I know I do. That’s three plus pitches with solid command of his entire arsenal. I would like to personally apologize to the hitters in the Florida State League because that’s simply unfair. 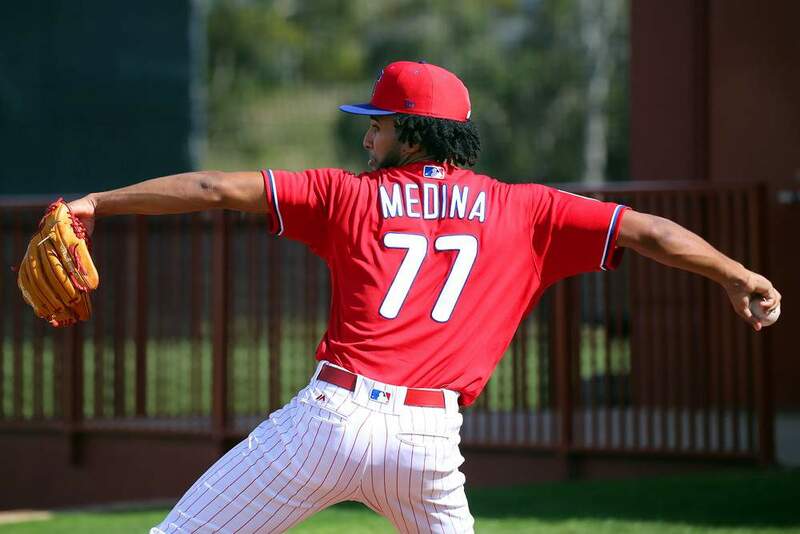 The ERA might not have been as low as it was in prior seasons, but make no mistake about it, Medina has one of the best arsenals of any minor league pitcher right now and is poised to join the elite ranks this season. Get prepared for plenty of video as he heads to my neck of the woods this season in the Double-A Eastern League with Reading. When it comes to Spencer Howard, the name of the game is command and control. When you look at his arsenal, you’ll probably think of him as a future #2 starter. You wouldn’t necessarily be wrong either. Howard features two plus pitches in his mid-90’s fastball and slider, while also mixing in a serviceable changeup and curve that both flash above-average at times. When he’s on, it can be a very long day for opposing batters. Just ask Kannapolis batters how they fared on September 7th against Mr. Howard. Spoiler, he pitched a no-no that day, striking out nine and walking one. The walk rate dropping from 5.7 to 3.2 last season is encouraging, and if Howard can continue to make gains there, he’s going to be well within my top-250 in short order, potentially within the top-150. He’s that good. You may not have noticed, but I am pretty high on the Phillies 5th round pick from last June’s amateur draft. I mean, I did rank him 7th overall in the Phillies system, right behind Spencer Howard. A Notre Dame product, Vierling combines above-average contact skills with 20-25 homer pop and the quickness and athleticism to annually exceed 10 steals, maybe even pushing 20 on occasion. This is an advanced collegiate bat that should move quickly through the Phillies system and push his way up prospect rankings while he’s at it. My 200-225 rank projection for 2020 below might be a little on the low end. Buy now. The Phillies have done a phenomenal job finding talent outside the first couple rounds in the last two amateur drafts. We already discussed their 5th round pick from last year immediate above, now on the docket is the man they took in the round just before Vierling. After a so-so NYPL showing in 2017, Scheiner put together a mighty fine 2018 season for Single-A Lakeland, hitting close to .300 and finishing with double-digit homers and steals. The speed might not ever develop into anything better, but with Scheiner’s above-average hit tool and raw power, a .280/25 hitter isn’t out of the question. Maikel Franco better start looking over his shoulder pretty damn quick because Scheiner is coming for his starting third base gig within the next season or two. You can almost copy what I said about Simeon Wood-Richardson above and past it here for Mason Denaburg. The 27th overall pick last June, Denaburg also features a plus fastball/curve mix with a serviceable changeup. The Nationals held him out of game action after the draft, but Denaburg got some work in during fall instructs and will make his professional debut in 2019. It shouldn’t him long to establish himself as one of the brighter young arms in the minor leagues and a potential top-100 overall prospect. Photo/Video Credit: Cliff Welch/Icon Sportswire, Jason Woodell, Fox Sports Braves, Josh Norris. 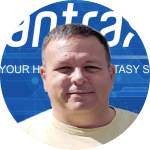 Fantrax was one of the fastest growing fantasy sites of 2018 and we’re just gaining steam in 2019! With multi-team trades, designated commissioner/league managers, and drag/drop easy click methods, Fantrax is sure to excite the serious fantasy sports fan – sign up now for a free year at Fantrax.com. Why did fantasy baseball league. MLBFAN48 stopped drafting midway thru the draft? We are stuck with half a team. will this be fixed or shall I go to another site? Hey Don, sorry your league had some issues. Use the support link – https://www.fantrax.com/contact and they can help you out.